ADComms attended, as guests and partners of Arriva Rail Northern (ARN), a presentation day unveiling the Class 158 Digital Train. The day included attendees from Network Rail, local councillors and members of the North East Rail Management Unit. 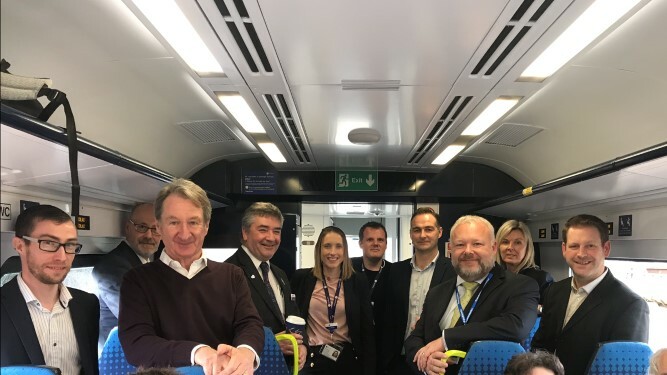 Following presentations by Northern, its supply chain partners and ADComms the group were given to opportunity to ride on the train which is now in service. The trip, a return journey from Newcastle to Morpeth, gave the opportunity to demonstrate all the elements of the new Digital Train including those systems provided by ADComms – Forward Facing CCTV, saloon and vestibule 360-degree CCTV, automatic passenger counting, USB charging at every seat and enhanced passenger information screens providing journey information and the opportunity for advertising content. In total ARN will deliver 243 refurbished train as part of a multi-million-pound investment programme to enhance customer journeys with new trains, more services, more seats, better stations and faster journeys. The upgraded trains give Northern customers a more comfortable journey with new seating and more leg room and provides them with digital improvements including USB charging sockets at every seat and free Wi-Fi throughout, enhanced passenger information screens and digital seat reservations. As part of an integrated solution for ARN ADComms are providing our bespoke cloud-based software – “Cloudbroker”. In addition to providing authorised users admittance to CCTV recorded images it also provides access to a wide range of asset data and live CCTV images.